Process Flow Diagram (PFD) is a schematic illustration of a process flow between major process units or equipment's in a plant. 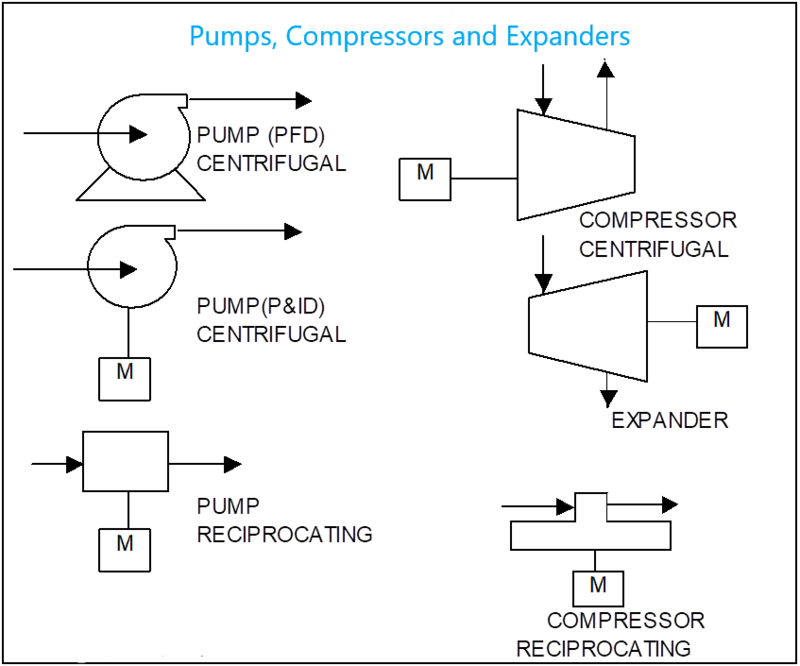 Process Flow Diagram hereafter referred to as PFD is a logical sequence of process operations. PFD's show the relationships between the major process system components. PFD is neither a scaled drawing nor shows the relative locations or elevations of equipment's or process units with respect to each other. It only shows the sequence and direction of flow. Simplified symbols are used to represent different types of equipment items. Process Flow Diagrams for large projects could run into several sheets. All incoming and outgoing lines are identified at the ends of the PFD in boxed arrows. The continuation PFD numbers are indicated inside the boxed arrows. For Piping Discipline, the PFD forms the basis for developing the Plot Plans as piping studies for all major lines can be carried out on the basis of the Process Flow Diagrams (PFD's). Utility flow diagram (UFD) is similar to a PFD and is prepared for utility services such as plant air, instrument air, nitrogen or potable water instead of process fluid. Only major process streams are shown. Only major instruments and controls are shown. Tag numbers of Instruments are usually not shown but maybe shown for clarity specifically any Emergency Shutdown valves or High Integrity Pressure Protection Systems. Process streams are numbered and their flow directions shown. Material balance corresponding to stream numbers are shown. Equipment Tag Numbers are shown with their rated capacity, overall dimensions, design pressures and design temperatures. Major pipeline sizes may be shown by some Organizations but materials and line numbers are not shown. Legend of all equipment's and instruments are shown either on the same sheet or on a separate common sheet depending on the size and complexity of the project. Below are provided example of symbols used in Process Flow Diagrams. These examples are generic and different Organizations have their own versions. 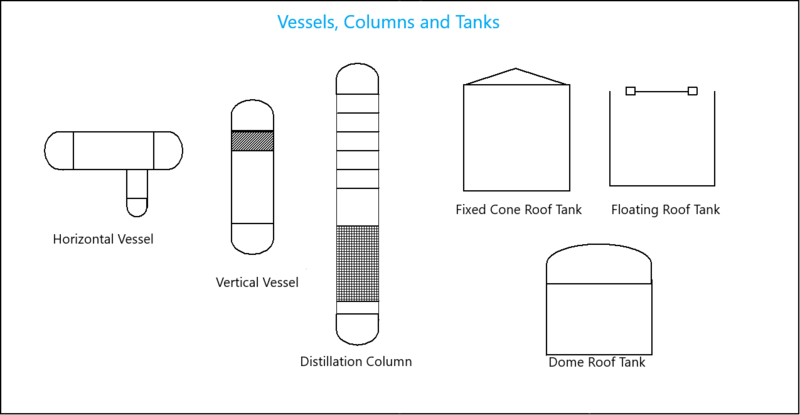 Diagram below shows PFD Legend for Vessels, Distillation Columns, Fixed Cone Roof Tanks, Floating Roof Tanks and Dome Roof Tanks. 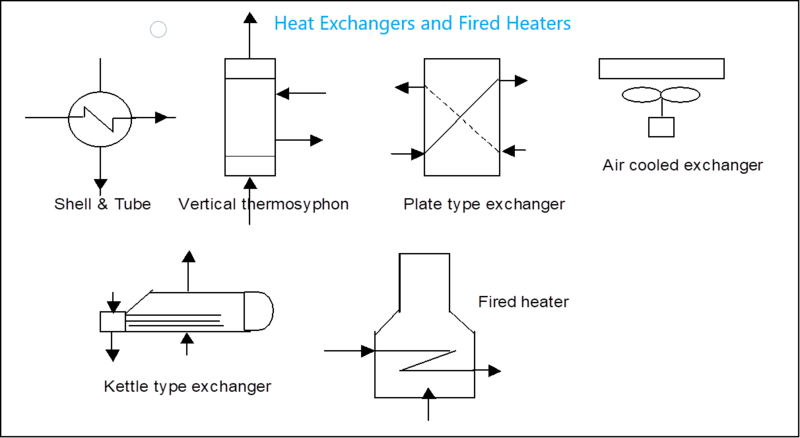 Diagram below shows PFD Legend for various types of heat Exchangers such as Shell and Tube Heat Exchangers, Plate Type Heat Exchangers, Air Cooled Exchangers and Fired Heaters.